Every now and then I receive a telephone number via an SMS. My cell phone recognizes it as a telephone number but quite regularly when I click it, the format cannot be interpreted correctly. Since I cannot edit the wrong number inside the telephone app, I have to remember the number or write it down. In either case, I am forced to manually insert the number in a correct format, which somehow misses the point of the SMS in the first place. The most sensible solution is to send the phone number inside the SMS in a correct format. The question is what is a correct format? For private numbers I usually do not use the last blank. However, if the local number has seven or more digits I usually insert a blank for readability, i.e. 1234567 would be inserted as 123 4567). All my contacts and all my various email signatures use this format. What I do not use: 0049 …, +49 (0)69 798 …, +49 (069) …, … 798 x42547, i.e. I avoid the unnecessary and most often misinterpreted zero. In any case, if you do not believe that this is an issue, send few numbers in different formats to your cell phone and check, which work without any hassle. Das Problem schildern oder auf aktuelles Ereignis verweisen. IST-ZUSTAND Wie verhält es sich derzeit? Wie erlebe ich den momentanen Zustand? SOLL-ZUSTAND Wie sollte es sein? Welchen Zustand, welche Situation streben wir an? Angestrebtes Ziel, angestrebter Zustand oder die ideale Situation. LÖSUNGEN Wie kann man diesen Zustand erreichen? Aktion Was müssen wir tun, um unser Ziel zu erreichen? Welche Aktionen müssen eingeleitet bzw. entschie-den werden? Konkrete Handlungsaufforderung, knappe tabellarisch formulierte Entscheidungen, die bejaht bzw. verneint werden. The work is not done until the paperwork is finished. A paper, i.e. a collection of texts, figures and tables, summarizing the work for a masters, bachelor or diploma degree, presents your various efforts in a form that can be comprehended by others. This post provides an idea on how to start, how to go ahead and how to complete such a paper. The components of the paper and their order should be: title, affiliation, keywords, abstract, introduction, results, discussion, summary, outlook, acknowledgements and references. This, however, is neither the order in which a paper is written nor the order in which most people read the paper. I have to be attracted by the title, I then read the abstract, glance over the figures, check the references, have a more careful look at the tables and start reading the summary. At any stage, I might either decide it is not worthwhile to continue or I decide I should read the entire paper. In the latter case, I will probably have another very good look at the summary of the data (figures and tables) before I start reading the entire paper from beginning to end. The order of its components is certainly not the order in which the paper is written. This post concentrates on how to write a paper and that means, in which order the components of the paper should be created. Collect the data that you created in the process of your work during last few days, weeks or even months. Create a first version of all figures, tables and mathematical formulas. Make sure to write long legends that explain everything in reasonable detail. Do not refer to text that you have not written yet to explain details in the figures. Include no conjectures, implications or interpretations: concentrate on the data. You will continue to work on the figures and tables and formulas and their legends until you submit the paper. Now that you know, what you have achieved during the past period of time you can develop a message. This means, you create a consistent story line by sorting the data and figures for the results and the discussion sections. The order in which you present the data in your paper does not have to be chronological, i.e. it does not have to follow the order in which you created it; it should be logical and comprehensible. You are not writing a novel, you do not have to capture anybody’s imagination; rather, you should make sure that the facts are laid out in a correct order for one of your peers. In many institutions you have to give a talk. The graphs, figures etc. form the basis for your slides and your verbal presentation provides you with an an excellent opportunity to test their comprehensibilty as well as the general story line. This is also the right time to realize that some data, experiments and/or evaluations are missing. Science in a very general sense is a vast field. You work in a particular discipline on a very specific subject. Most of the work you have done will be a repetition of what others have done before you. Most of your conclusions have already been concluded by others. Accept it, other scientists will have come up with similar data and similar conclusions by similar means. Phrased positively, you confirm their findings and prove that you are a capable person in a laboratory. Through a combination of hard work and good luck you might have been able to extend the knowledge in your field. With even more luck you might have even been able to extend our knowledge on science in general. Where in the world of science is your contribution? The introduction you are about to write embeds your contribution in what we know, with details of what you know in your discipline and it embeds your discipline in science in general. This is confirmed by the references to papers by other laboratories, papers by other members of the laboratory you are working in and papers decscribing your own work. You tell the rest of the world where your contribution fits into the general framework of your discipline and that of science in general. It is usually a very good idea to write a very detailed and long introduction. It might be too long for the paper you intend to submit, so you will shorten it later, but if you intend to publish more than one paper or intend to continue in this field or on that subject your generic introduction will improve over time. You will find more references, you will refine the references and you will understand the part of the message of some papers that actually concerns you better. You will adapt your generic introduction to the paper you are writing. The very last paragraph of your introduction explains what the reader can expect from this paper. You define the questions you intend to answer and you explain the results in broad terms. Again, you are not writing a novel and you do not have to generate any element of suspense. It is much more important that the reader knows what to expect. The idea is to connect to the message and not to the medium. The introduction and the legends are special in the sense that you will most likely be able to re-use them later in your career. Most of the references in your paper are required in the introduction. You will probably refer to many of them in the discussion. Maintain a list of references and make sure you know what the main messages of these papers are. Since you have all the data in your figures, tables, graphics and collection of mathematical formulas as well as an outline of the message of your paper, i.e. your story board, writing the results section should be relatively straightforward. Make sure you restrict yourself to facts. Avoid any interpretations of your data. It should start to become clear why the different experiments were required and how they relate to each other. The results section should contain very view references since most if not all the material you present is originally yours. The discussion embeds the results into the common line of science. It essentially addresses the issues you raised in the very last paragraph of your introduction. You answer the questions you have posed and you explain why and how you filled in the various gaps in our knowledge. If you have come up with a new model or a significant change to a currently accepted model here is the place to present it and to illustrate it with some figures of your own. The summary should contain no new information. It simply summarizes the paragraphs mentioned above for those who do not intend to read your complete paper. If the paper is short you can obviously skip it, but if your paper is somewhere around 80 pages long do not hesitate to invest 2-3 pages in a very well written summary. questions remain un-answered, which new questions came to your mind and which different approaches you would recommend for future experiments. If you wish to speculate, here is the place to do it. The abstract summarizes your paper. It embeds your paper within your discipline, it points out what you have done and which techniques you used. It says explicitly why your paper is important. The abstract outlines your various findings and indicates their novelty. Your abstract should definitely contain the specific facts, numbers or relationships that you regard as important. Make the effort to write the abstract from scratch and do not copy phrases from the other text fragments to describe the content of your paper. Consider that only the abstract and the title are guaranteed to be available online and will be indexed by specific keywords and phrases. Therefore, most scientists will only find your paper it if you have phrased the abstract using the commonly applied terminology. The title is obviously extremely important since it will attract most readers. Use the allowed number of characters and make absolutely sure the title contains your sub-discipline’s keywords and the main message. Do not worry if it changes several times while you review the paper. Use a simple running title while you write the paper and do not worry about it until now. Do not hesitate to acknowledge how others have contributed to your work. However, concentrate on the professional help and mention details wherever this is appropriate. Make sure that the acknowledgements are correct and well balanced. Your project might have started quite a while ago and many who have helped you might not be on your mind anymore. Your paper makes your work a part of the scientific literature. It essentially consists of three parts: the introduction, the results and the discussion. 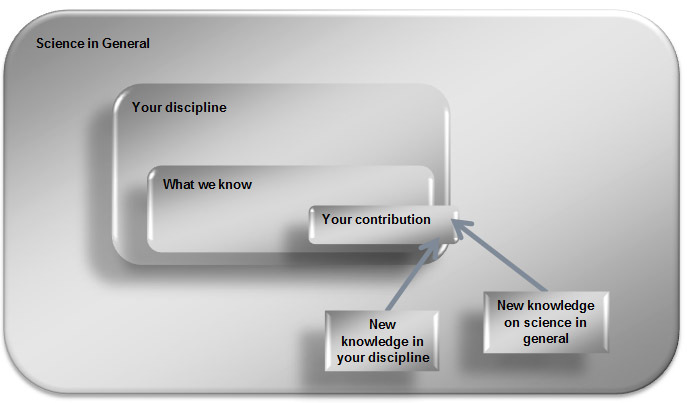 The introduction sort of positions the paper, while the discussion provides your opinions on how the results should be interpreted, how they fit in with what is already known, what is new and how they contribute to your discipline and to science in general. the same if the experiments were reproduced elsewhere on this planet “or on the moon”. This is one very good reason, why it is very important to distinguish between data and implications. In the end, your paper will most likely be judged by the data it has produced rather than by your speculations. In the very beginning, most of the effort should be spent on reviewing the data, re-checking the laboratory book, reviewing the methods & materials, collecting information on the machines, tools and kits that were used for the experiments and on summarizing the data in figures, graphs, charts, tables and collections of formulas. In the end, most time should be spent on the abstract, the title and on the first one or two paragraphs of the introduction. These may only amount to 2-3 pages of text but they are the most crucial parts of the paper. They will be read by at least an order of magnitude more people than your entire paper. The most common mistake is that authors start with the abstract. They summarize a paper that has not been written yet and simply produce a list of promises. The importance of writing the abstract at the very end cannot be over-stressed. Another very common mistake is that the legends are not complete. It does not matter if the legends are too long you can always shorten them. But it is very important that you have a set of complete legends in the very beginning of the paper writing process. Once you have a first draft of figures, tables and formulas you will discuss the message of your paper with your boss and your peers. Complete legends are essential, otherwise nobody has a chance to understand the exact circumstances under which the data had been gathered. As long as you cannot convince your boss and your laboratory peers that your paper is worth reading it is very unlikely you will convince anybody else. Do not be afraid to write too much and in too much detail. Details that were left out while writing the text are very hard to fit in later. It is usually much easier to shorten a text than to lengthen it. You might also want to re-use some paragraphs in another paper. Most likely you will place the emphasis a little bit differently, which means you will shorten the text differently and you can do so without having to write a new text from scratch if you considered the leeway in the first place. Self-plagiarization is a misconception. Your texts are yours. Use your older texts, take advantage of good phrases and good ideas you have come up in the past, insert them into your new texts and then edit them and reshuffle their order to improve the new text and to adapt it to the current circumstances. Whenever you write, consider the fact that you may be re-using the texts. Eine Liste der Teile, die man bei einer Reise eventuell dabei haben möchte. Die Liste soll mich daran erinnern, welche Teile ich bei diversen Reisen gebraucht habe. Am besten während des Packens verwenden und nach dem Packen einmal kurz überfliegen. Jeder Vorschlag, die Liste zu ergänzen, wird gerne aufgegriffen. Die Liste wird immer wieder auf einen neueren Stand gebracht. Version 1.02 vom 8. November 2011. A well-known concept in rhetoric is referred to as the five sentences technique. This essay explains the idea and illustrates it with a number of examples. Whenever a person becomes a member of my team, I have to explain how papers, short texts or letters should be written. Incredibly, most people are never taught how to structure a text and in which logical order the elements of a text should be offered to the reader. It could save me a lot of time if somebody taught students the basic structure of a prose text. A written instruction with some examples would serve just such a purpose. Therefore, I decided to write such an instruction and make it freely available. Actually, you just read the first instruction. The key to writing a comprehensible text is a five sentences technique, which used to be taught in a classical rhetoric course. The five sentences follow our human logic, i.e. the way you and I think. Simply answering five questions, i.e. generating five well-phrased answers, allows us to systematically organize our thinking. Hence, by following the five sentences technique we guide ourselves in phrasing our thoughts and making it easier for others to understand our intentions and goals. In consequence, the five sentence technique allows us to communicate with less effort and improves the chances that other people actually know what we are talking about. Interaction should be a two-way process, you understand me and I understand you. In the end, you and I should now how to proceed, i.e. which actions should follow our communications. In the five sentences technique you essentially answer the following set of five questions. Incentive Why do I speak? Why do I make myself heard? Why do I address you? What motivates me? moment? Which issue do I have to address? Anticipated situation Where do I want to go? Which situation would I like to see? Which situation would help me? Solution What would help me to achieve the expected or anticipated situation? What would help you to solve the current issue? Action What am I actually going to do to? What changes the current situation? What takes advantage of the solution? Which decision should you take to induce the change? The following paragraphs provide a number of examples. Most of the texts have actually been used in letters, memos, discussions or seminars and proved to be the basis of a successful effort. Incentive Whenever I enter the kitchen I struggle to find a clean dish. Present situation Everybody uses the cutlery and the dishes, but nobody bothers to clean up. Anticipated situation Whenever I use the kitchen I find a clean dish. Solution I should own and maintain a personal set of kitchen ware. Action I will purchase a locker, in which I keep my set of dishes and cutlery. More than one sentence can be used to answer each of the five questions. Incentive Yesterday, after I picked up my car, I realized two issues remain unresolved. Present situation The gear box continues to make funny noises and the clutch seems to be a bit loose. Anticipated situation Whenever, I ask a garage to repair my car, I expect the mechanics to record the problems I have and to take proper measures. If they cannot solve the problems they should give me a ring. Solution I would like to leave my car with you for another day and allow you to fulfill your duties towards me as your customer. Action Please address the two remaining problems and call me as soon as the repairs are concluded. Make sure the situation is resolved by tomorrow evening. Even texts that are several pages long can be structured with iPASA. Incentive The microscopes in our laboratory produce huge amounts of data, which have to be stored until they can be processed and transformed into smaller data sets, lists of qualifiers or videos. Present situation Currently, no such centralized image storage facility is available and images are stored on separate hard disks, which have to be carried around and maintained by the users. The amount of data produced is well beyond the capacity of any back up device. Anticipated situation An optimal solution is an image server that stores the images for a reasonable period of time, i.e. a period that allows the users to perform the required data processing. The users will delete their images from the image server and only back up the considerably smaller amount of necessary data. Solution An image server with a capacity in the 100s Terabyte range is set up by the Central Computer Group. Access to the image server is unrestricted but data that is unprocessed for a reasonable period of time (e.g. two weeks) is simply deleted. Action We will set up a 300 Terabyte server based on S-ATA II disks. In a RAID 10 arrangement 200 disks are required. A RAID 5 or 6 would require ~120 disks. Since progress in disk storage technology is expected and prices dwindle quickly such an Image Server could be upgraded by 50-100% every year. The Central Computer Group requests offers from at least three vendors (URLs attached) and the committee evaluates the situation in one week. The main mistake is to leave out the fifth step, i.e. the action. Consider, it may not be obvious to the person or group of people you are addressing, which conclusion they should draw. Help them by suggesting an action. All they have to do now is to decide on Yes or No. They either follow your suggestion or they defy it. In the very least, you are making it easy for everyone to decide and to leave this matter behind them. After all one of the secrets of excellent management and quick decision making is to pick up an issue once and only once and to make rather than leave a matter un-decided for too long. I always use the iPASA key questions to structure my texts. I start by typing the five keywords as headings. Particularly when working on texts such as a one page abstract or the introduction to a complicated issue I tend to shuffle the sentences or even whole abstracts around until they seem to fall into the iPASA structure. However, I usually removethe five iPASA related keywords or replace them by context-related headings before I submit the text. The basic iPASA idea is not mine. I was taught the concepts during a course on rhetoric, which I attended in the late 1980s in Heidelberg (Germany). In German, the concept is called MISLA, which abbreviates: “Motivation, Istzustand, Sollzustand, Lösung & Aktion bzw. Appell.” The teacher herself drew on more modern sources that are unknown to me, but could be Wittsack (1935) and Geißner. A similar concept known as AIDA (attention, interest, desire, action) is actually intended for sales purposes rather than rational decision making. This text, however, is my text. Although I wrote it myself from scratch, I, of course, took advantage of the fact that I had the chance to discuss the concept well over a dozen times and to test it well over a hundred times. Since no text is perfect, I look forward to your comments, further examples and improvements on the text. I would be happy to include and acknowledge all contributions in future versions. Where is our space in space? Will we ever travel through space and through time? gigantic (the ISS is located between 280 km and 460 km above the earth’s surface). The situation is even worse, since this energy is usually stored via chemicals, which have are transported until they are consumed. The main energy source is currently oil or a mixture of its derivatives. The slump in research on nuclear fuels makes it very unlikely that nuclear power of any kind will contribute to space exploration in any reasonable amount. For very much the same reason, we will also never really be able to move through time. Neither I nor most likely anybody else has any clue how we would move through time in the sense that we would drop out of the current presence and re- or pre-appear at some other time in a location close-by. In any case, it seems quite likely that the amount of energy required for time travel would be enormous. Otherwise, i.e. if the energy levels were very low, we should permanently see things (not only people) disappear and appear all the time. A very nice and at the same time very depressing book (for those of us who dreamt about space exploration when they were young and innocent) is “The Physics of Star Trek” by Lawrence Krauss.